This book introduces plant metabolomics, an experimental approach that is important in both functional genomics and systems biology. It can be argued that metabolite data is most closely linked to phenotypes and that changes in metabolite content or metabolic networks can therefore indicate gene function more directly than mRNA transcript or protein based-approaches. Additionally, the identification of metabolic markers has important applications in plant breeding. 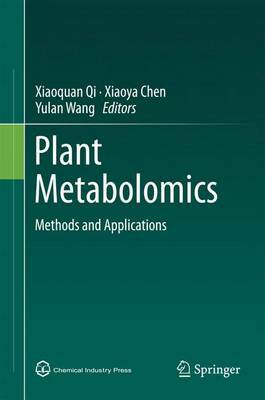 The book, written by researchers who are active in plant metabolomics in China, not only introduces the fundamental concepts and the latest methodological advances in the field of plant metabolomics, but also details new studies from the respective scientific programs of the authors and thus reflects the current state of domestic plant metabolomics research. Professor Xiaoquan Qi is the principal investigator at the Institute of Botany, CAS. Professor Xiaoya Chen is a member of the Chinese Academy of Science and also is the principal investigator at the Shanghai Institutes for Biological Sciences, CAS. Professor Yulan Wang is leading a team in BioSpectroscopy and Metabolomics at the Wuhan Institute of Physics and Mathematics, CAS.